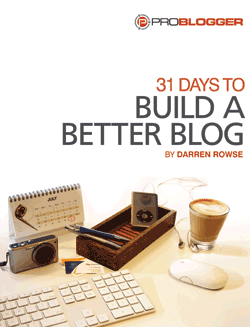 31 Days to Build a Better Blog is a downloadable e-book designed to help you revitalize your blog by giving you 31 tasks that will all help to turn it into the page view powerhouse you've always dreamed of. Join with 16,000 other bloggers and Kick-Start Your Blog with this 31 Day Challenge. If you have big dreams for your blog but have been putting improving it in the ‘one day’ basket - you’re not alone. A Task - something to DO that day. Teaching - each day you'll be given great instruction on both the WHY and HOW of the task of the day. This two pronged approach is designed so that you come away from the challenge having not only learned how to build a dynamic a blog but you'll have actually DONE something with the knowledge. Monthly Cycle - bloggers using the tasks again and again each month as a monthly routine for their blogging. Occasional Inspirational Resource - bloggers dipping into 31DBBB on a more occasional basis - using it on days when they have time or lack inspiration. The great thing about 31DBBB is that you can do it at your own pace and in your own way. This workbook is NOT designed for bloggers yet to start a blog (PreBloggers). It doesn't cover setting up a blog. If that's you check out the ProBlogger book which covers this aspect of blogging. All in all the daily tasks are 31 steps to transform you blog into a valuable online asset. If you're not satisfied with the 31 Days to Build a Better Blog work book after 31 Days Just let me know and I'll refund your money - that's how confident I am that this is a resource that will help you build a dramatically better blog. As an extra bonus for buying the workbook Darren has recorded a 1 hour Question and Answer session where he tackles some of the most frequently asked questions by bloggers wanting to take their blog to the next level. You'll get a link to down load this once you've bought the workbook (look out for an email from Darren shortly after purchasing with details of this). 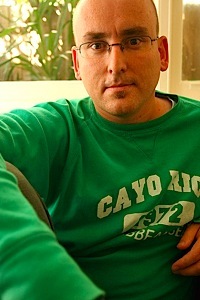 Darren Rowse has been blogging since 2002 on over 30 blogs. He's been earning a full time living from his blogs since 2005. These days he focuses his time upon ProBlogger.net (Blogging Tips), Digital-Photography-School.com (A Photography Community) and TwiTip.com (Twitter tips). These three sites reach a combined audience of over 3 million a month. Darren is the author of ProBlogger the book, co-founder of the b5media blog network and speaks regularly on blogging and social media. Download Your Copy of 31 Days to Build a Better Blog for an Investment of $19.95 This 94 page resource (actually it's 188 pages as there are two pages on each page really) is ready for your download right now. At 64 cents per daily task this is a resource that is designed to bring life and revitalization to your blog again and again as you continue to use it over coming months and years.